Barry moved from his native Manchester to Cornwall in 1979 where he met and worked alongside a group of extremely active artists. 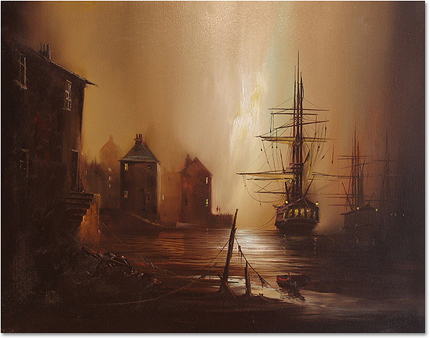 Barry has a talent for capturing the mystery of ships with their tall masts at anchorage, tethered in harbours and inlets in misty moonlight. After discovering this, and with nostalgia in mind, he went on to paint Victorian gas light street scenes. These have proved to be extremely popular. Read the full Barry Hilton biography.